The importance of the practical training component of the CA Sri Lanka Chartered Accountancy curriculum was highlighted recently by the Institute’s Vice President Manil Jayesinghe who emphasised that the training helped professionals acquire important human skills which allows them to become competent accounting professionals. Jayesinghe noted that while obtaining technical knowledge is important, it is also important to acquire the necessary human skills which allows the professionals to use the technical skills he or she gained during the study program. He noted that unlike an academic qualification, a professional qualification is always a step ahead as it focuses on a two vital aspects, which is to ensure that the professional is competent and has the necessary skills to carry out the job role. “When an accounting professional follows a professional qualification, he or she not only gains the knowledge but also understands how to use the knowledge to solve problems,” he said. He added that this is why the CA Sri Lanka curriculum was structured across three important pillars; knowledge pillar, skills pillar and personal pillar, which allows an aspiring chartered accountant to gain the necessary technical knowledge and skills, which are important in carrying out the job role. “These are the three fundamental pillars the profession is built on to help produce competent accounting professionals,” he added. The inaugural induction program for trainees in the public practice sector organised by the Institute of Chartered Accountants of Sri Lanka received overwhelming response with 100 trainees representing the sector taking part in the two-day event. The program was organised for trainees in the public sector who are currently receiving training at approved organisations of CA Sri Lanka. The event, comprised of 14 technical sessions conducted by CA Sri Lanka members who are practitioners in the public practice sector. 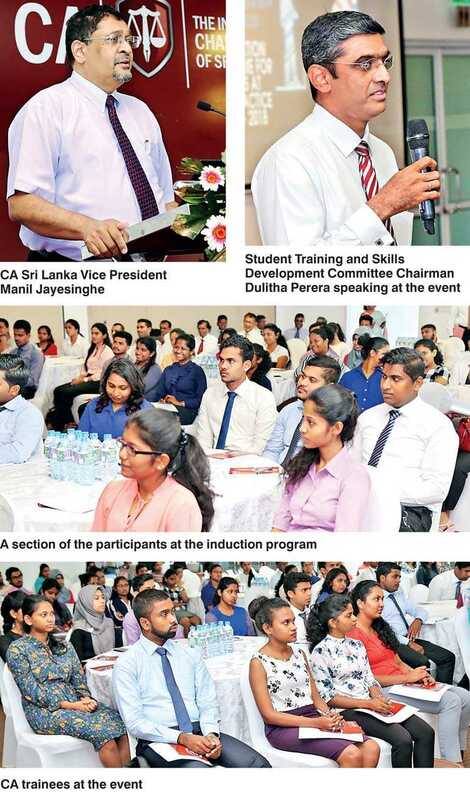 Student Training and Skills Development Committee Chairman Dulitha Perera speaking at the event said the committee’s primary duty was to ensure that the Institute produces well-trained and skilled accountants for the market. “Whether you are a chartered accountant or an accountant at an intermediary level, you must always ensure you maintain the same quality standards we have set for ourselves for the profession,” he said. Perera added that it was the first time that such an event was held in the history of the institute. During the two days, the CA trainees gathering substantial knowledge in relation to the importance of professional ethics, client management, the need for effective communication skills, audit procedures, and various regulatory compliances that SMEs should comply with, among many other areas which are believed to be of significant value for trainees, who are aspiring chartered accountants.